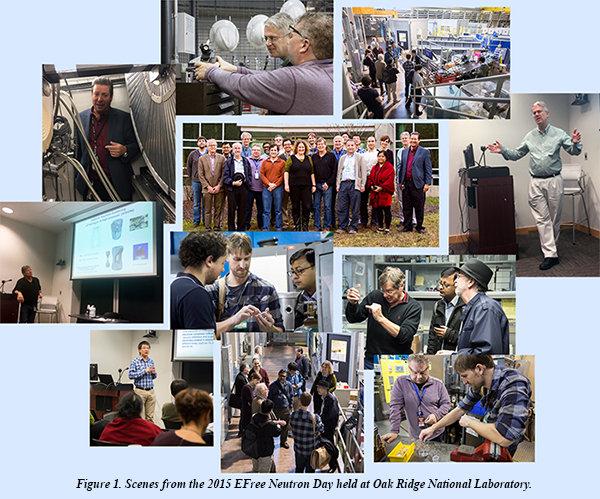 EFree held a Center-wide Neutron Day on December 10, 2015 at the Spallation Neutron Source (SNS) at Oak Ridge National Laboratory (ORNL) in Oak Ridge, Tennessee. After introductory remarks by Richard Ibberson, Director of the Chemical and Engineering Materials Division (CEMD) and EFree Director Russell Hemley, and a tour of the SNS facility, representatives from all EFree projects discussed current and future needs for neutron scattering techniques. Over 20 SNS Instrument Scientists from more than 10 different beamlines attended the discussions and provided their perspectives on potential uses of neutron techniques for EFree science. Additional topics addressed at Neutron Day included ways in which EFree could facilitate high pressure science across the SNS. Five group leaders from the Chemical and Engineering Materials and Quantum Condensed Matter divisions also attended the discussions. A schedule of the review can be found here.